Brownie Meets Cheesecake and Love Ensues! I never thought I would want another brownie recipe after I made the gluten free version that is so easy to make and so tasty. Then I met this recipe. It is from a book of Gluten Free Christmas cookies, by Ellen Brown that my best friend gave me for Christmas. I made some very minor changes. It is like a brownie and a cheesecake meet, fall in love and this is their baby! A bit more work than my other brownies but just totally nummy good! And I am not a big cheesecake lover. This is an exception to that rule. Make sure the cream cheese is room temperature. Do not use fat free cream – it is dreadful in baking! I get the best quality chocolate I can find. Frankly I often use regular salted butter in my baking. It is what I normally have in my kitchen so I tend to just use it. Melt chocolate and butter in a heavy saucepan, stirring frequently. Take off heat, cool for 5 minutes. Grease an 8×8 pan and dust with rice flour. Combine 2 eggs and ¾ c. sugar in mixing bowl, beat with electric mixer for 2 minutes until light and fluffy. Add cooled chocolate mixture and beat one minute. Add dry ingredients and beat at low speed just til mixed. In a separate bowl combine cream cheese, remaining ¼ c sugar, other egg and vanilla. Beat with electric beater for 2 minutes. Spread chocolate mixture into pan, Top with cream cheese mixture, swirl together with spatula. Bake at 350 degrees for 35 minutes, until top is springy. Cool in pan on wire rack until completely cooled before cutting into 16 to 20 squares. Store in airtight container between wax paper sheets for up to 5 days, room temp. Can freeze for up to a month. Mine weren’t too swirly but the cream cheese mixture mellowed the chocolate into a creamy dreamy delight. There were very few leftover squares. 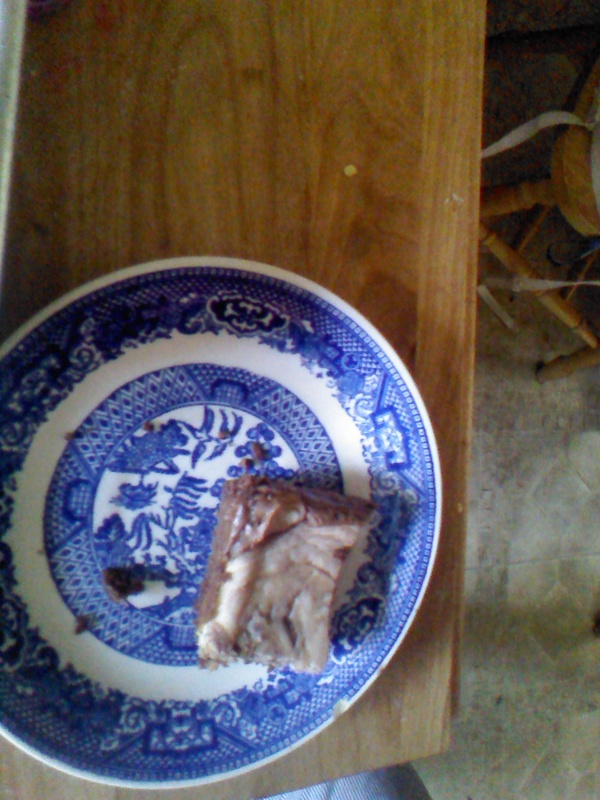 I took this photo of the last brownie square the next morning! I know this recipe is a lot more work than the other one I had blogged some time ago but if you like cheesecake you will love it and it makes a nice change of pace or a great snack to take to a party.